A topical Vitamin C serum is one of the most important products in your skin care arsenal. Loaded with antioxidants, Vitamin C not only works to prevents environmental and UV damage to your skin, but also stimulates collagen and repairs damaged cells to reveal healthy skin that glows. At Handcrafted Beauty, we understood the power of this beauty booster, and spent over a year perfecting a unique formulation that’s sure to enhance the appearance of your skin. Our Vitamin C serum combines high quality vitamin C with fruit and herb concentrates, to create a light weight, concentrated serum that instantly brightens and promotes beautiful, vibrant skin. To really kick things in overdrive, we added a shot of Organic Lemon Essential Oil which gives this amazing serum a beautiful citrus scent. Vitamin C is more than a beauty buzzword. Recent clinical trials have Dermatologists, Plastic Surgeons and even Dr. Oz in agreement that Vitamin C not only protects, but helps reverse the signs of aging. If you’re over 25 years old, you should add a Vitamin C serum to your daily skin care regimen!!! Desired results can be seen in 4-8 weeks. We carefully handcraft in small batches, with real ingredients that support optimal skin health. 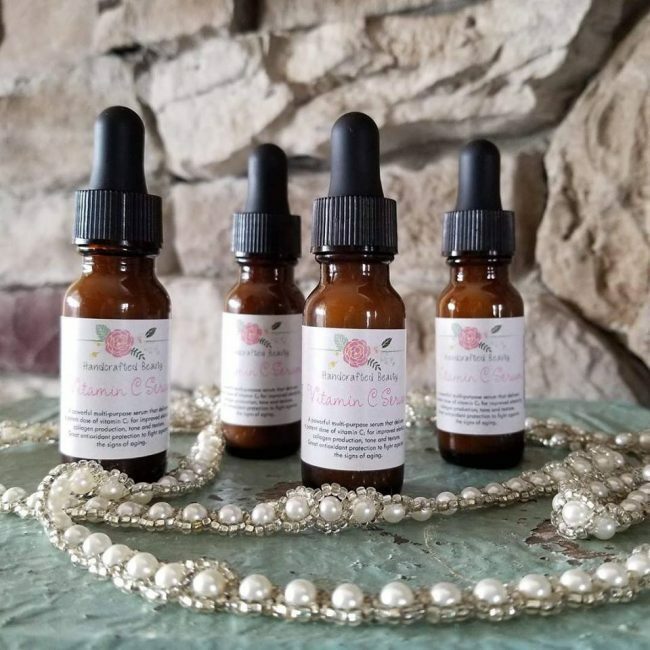 Handcrafted Beauty Vitamin C serum should be used after cleansing and toning. Best results when used in AM. Shake the bottle well as the formulation can be a bit thick (this is perfectly normal). Place a pea sized amount of Vitamin C serum onto fingertips. Warm the serum between your hands and spread evenly over your face without pulling down on the skin. Apply with fingertips in circular, upward motions gently. Don’t help gravity by tugging down on your skin and remember that the skin on your face, especially around the eyes, is very delicate. The serum should be completely absorbed by your skin within 5 minutes. Follow with the Daily Moisturizing Oil. Aloe Leaf Juice: Known for moisturizing, soothing and healing properties. Rosehip Seed Oil: Extremley high in essential fatty acids, rich in Vitamin C and A, which helps lighten dark spots, and reduce the appearance of fine lines and wrinkles. Vitamin C Ester: Stabilized topical C known to stimulate collagen, instantly brightens and tones skin, provides strong antioxidant protection. Heals damaged skin cells, reduces the appearance of dark spots. Organic Cranberry Extract: Known for strong antioxidant properties, as well as reducing inflammation. Organic Raspberry Extract: Known for strong antioxidant and cancer fighting properties as well as its ability to brighten and improve skin tone and texture. Organic Blueberry Extract: Improves the appearance of broken capillaries, and splotchy skin, as well as reducing inflammation. Organic White Willow bark: boast the benefits of being anti-microbial, anti-inflammatory, anti-fungal and exfoliating. Willow bark contains salicylic acid, derived from salicin, which helps to fight acne. It’s also a beta hydroxy acid and helps to exfoliate your skin by sloughing off dead skin cells, making way for fresh skin renewal. I ordered this serum and was not really sure what it was about. However, it is fabulous! I ordered two more. It makes my skin feel so nice and gives it a little glow. I am feeling so much more confident with my 35 year old skin thanks to these products. I use the almond cleanser, the toner, Vitamin C in the morning, and then the oil. Love! By far one of my most favorite products! I love the fresh lemon scent and best of all it has helped even out my skin tone! This serum is fabulous!! I use it at night after I cleanser and spritz my face with the rose water toner. This stuff smells amazing and makes my face feel so clean and fresh! I’ve also had much clearer skin and way less ‘that time of the month’ breakouts since using this regimen. Love my handcrafted beauty products!